The Buddha giving a lock of hair from His head to God Sumana Saman, when the latter asked for some object to worship. Mahiyangana Cetiya is said to have been build by God Sumana Saman enshrining the hair relic. Duruthu, the first Poya in the Buddhist calendar is known for the most significant event in the history of Buddhism in Sri Lanka. 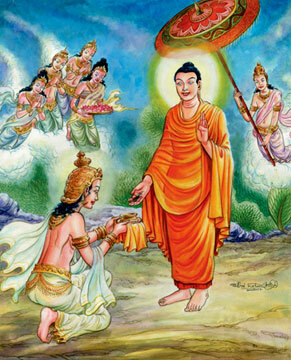 Sakyamuni Gautama Buddha's first visit to Mahiyangana had taken place on a Duruthu Poya Day. This is an event of great historical importance, because this sacred event has preceded the introduction of Buddhism to Sri Lanka by Venerable Thera Mahinda in 247 BC. After attaining Enlightenment Sakyamuni proceeded to Saranath and preached His first sermon to the five ascetics. Later Yasakulaputra and his 55 disciples attained Arhantship. They were sent in different directions to preach the doctrine of the Dhamma. Having sent them on this great mission, the Buddha Himself set out for the city of Rajagaha where on His way He met the hermit monks - the three brothers, Uruwela, Nadi and Gaya Kashyapa together with their 1,000 disciples at Uruwela Senanigama. They too attained Arhantship after listening to Adittapariyaya Sutta which the Buddha delivered with His absolute knowledge of the Dhamma. After this celebrated religious event, the Buddha is said to have focused His attention towards Lanka. Ancient chronicles reveal that the Buddha arrived at Mahanagavana, the splendid park in Mahiyangana located in the vicinity of Mahaweli Ganga. Here, the inhabitants who belonged to the Yakka tribe, who with their rough behaviour though opposed the arrival of the Buddha, they did have the good fortune to be blessed with the teaching of the Buddha. They were all miraculously won over by the Buddha helping them to be good righteous citizens. The most significant event at this juncture was the presence of Deva Mahasumana, the guardian God of Mount Samanala who attained the State of Sothapanna after listening to the sermons of the Buddha. According to Mahavamsa, the earliest Buddhist Relic was the Hair Relic of the Buddha which had been offered to Deva Mahasumana when he begged Thathagatha to give something to worship on His first visit to the island. Accordingly He gave him a handful of hair from His head which Mahasumana placed in a golden casket and later enshrined in a Stupa embedded with blue stones, built to the height of seven riyanas (a measure) Mahiyangana Chetiya is given much significance not only because it is the first Dagoba built in Sri Lanka, but also it is the first one built by a divine being on the spot where the Buddha made His first visit to the island. His attainment of Sotapanna was the other great event of this Duruthu Poya Day. After the Parinibbana of the Buddha and the distribution of the Sacred Relics, the remaining Neck Relic (Greeva Dathu) was brought to Sri Lanka by Arhant Sarabhu - a pupil of Venerable Sariputta and enshrined in the Mahiyangana Dagoba raising it to 12 riyanas. History reveals that later it was built to a height of 30 riyanas by King Uddachulabhaya, the brother of King Devanampiyatissa. Still later it had been completed to a height of 80 riyanas by King Dutugemunu. We all have to understand the nature of the body. And it should play a central feature in our investigation and contemplation of the teachings. The Buddha taught the Anattalakkbana Sutta, the discourse on not-self. This discourse was given to the five ascetics that had attended on the Buddha. On listening to this particular discourse, they were liberated. All of us here are similar to the five ascetics in that we all want to be free, to not have to experience the difficulties that are attendant on having a body and a mind and with being in the world. The body is a helpful foundation for investigation because it is something that is with us, we live in it. We inhabit these bodies, and when we do understand their nature, then they give us an insight into the nature of the world around us. We're like a person who has a house, and it's a bit old, a bit dilapidated, needs repair, and we need to worry about and attend to it. Similarly, we all have bodies that we have to look after and care for, we have to worry if they get sick, cold, tired, and there's a burden there. The nature of having existence, of being born in the world, for everybody, is that we're born with bodies and minds. This is what constitutes birth, what constitutes having a life. It's something that everybody in the world has, and it's having a body and not understanding it that leads to suffering and confusion. However, we have to rely on these bodies, we can't do without them, we can't not have them, so it's incumbent on us to try to understand them, so they don't create problems for us. One of the aspects of having a body and mind, but particularly a body, is that there's a strong focus on the body because it's tangible. The body being physical and tangible, it's easier to reflect on and investigate. But it's a source of our sense of self, the creation of a self, the creation of attachment around an image of who we think we are. Then we compare ourselves to others, look at other people's bodies, and take them to be selves, take them to be entities that we compare ourselves to and compare them according to the whole realm of "I" it's actually quite burdensome and confusing. So today I'd like to give some reflections around these aspects of the teaching according to my own ability and my own understanding. It's necessary for all of us to study carefully the nature of the body and to be able to reflect on that nature. It goes across the board in terms of whether we're male or female, whether we're young or old, whether we're monastic or lay people. One of the things to do is just to take the progression of change in life as a theme in the sense that when somebody is born they're a tiny little being and they grow and start to be able to move around and talk and do things. They become adolescents then adult and continue to change, continue to mature - it manifests in different ways, this change all the way to old age and finally to death. Normally for most people there's not a lot of reflection on these natural changes in life. This is where the Buddha taught that what obscures or obstructs seeing the truth of change is something called santati, which means continuity - there's a continuity of change and it's progressive, it's not abrupt. This continuity obscures and covers over the reality of impermanence. This makes it necessary to use reflection and investigation because the tendency is not to see it. There's just this continuity, everything's sort of flowing along okay, but in reality change is taking place. if you look, all of a sudden maybe you've got to go to the dentist because you've got cavities in your teeth, or whatever - changes happen. Or we're experiencing some sort of ache or pain or some sort of illness, and it creeps up and changes, and you end up having to deal with it. But there's this continuity that tends to obscure it, we don't take clear notice of it, we don't really pay attention, we don't hone in on it and see: "Ahh... this really is impermanent." This is anicca. The Buddha used the word anicca to describe this truth of change. In English we can use the word 'impermanence' or 'inconstancy' or 'uncertainty' - those are all words that describe the reality of anicca. In the same way that we look at other people - and the world around us and reflect on the nature of change, we should be paying attention to ourselves, turning that attention inwards and recognizing that what is changing is not just other people - those people out there - it's us as well. We're in a constant state of change or flux. We need to attend to this so we don't allow that felling of continuity or that illusion of santati to obscure things. So bringing the investigation back to ourselves. Turning it back on ourselves and then seeing - is this as the Buddha taught or not? We have to verify that for ourselves - if what the Budhda taught is actually true. We hear that the body is impermanent and it seems like a fairly direct and easy statement, but the Buddha used it as a basis for teaching and pointing to very basic truths. Like in the Anattalakkhana Sutta, He asked the five ascetics, "Is this body permanent or impermanent?" And of course they have to answer "Well, it's impermanent." He says, "well, if the body is impermanent, then is it pleasant, happiness, or is it suffering?". "Well, yes, it's suffering, it's unsatisfactory." It seems straightforward but we really have to notice that whatever is impermanent tends to be unsatisfactory because it always changes and becomes otherwise. This is the nature of suffering or unsatisfactoriness. This word suffering is not just about feeling miserable, but more describing the way that something is not capable of completely and fully satisfying us. Change is a key element that helps us to see that nature, that tendency (to suffered). Notice this truth of change. Change starts immediately, even when we're conceived then change is happening and there is this element of suffering. When we're conceived and we're in the mother's womb then we're changing and growing all the time. There's an element of confinement there, being within the mother's womb. We're confined and sort of curled up and if anybody's ever seen in the forests in Thailand in the jungles, during the monsoon when the rains come, the monkeys are in the trees trying to protect themselves from rain and they're all curled up, like a baby in the womb - it doesn't look very comfortable. Then of course were we born and the first thing people do when they're born is cry. That's really what every baby is doing, that's it's exclamation of truth: "Wow, this is suffering!" This is just the nature of life, even little babies understand this: "Wow, this is suffering!" Observe little babies when they're small, they see their older siblings or adults and they notice them walking and getting up. They're still quite small and not able to do that and they look and try to mimic that, and there's. A Dhamma talk given by Luang Por Plien at Abhayagiri. vihara USA Translation by Ajabn Pasanno. Euthanasia is legalised in several countries in the world including Switzerland, Belgium and Netherlands. In Japan, there is some legal framework for doctors to practise euthanasia on unavoidable circumstances. In Australia, meanwhile, euthanasia is legal in her northern territory. Though, in the United States and England have never passed legislation for euthanasia. However, on specific circumstances the permissions given to doctors to withdraw life-support machines when there is no any assurance whatsoever of the patient's life. There are, however, ongoing debates of the practice of euthanasia. For example, recently The United Nations reviewed and commented on Netherlands' euthanasia law. There are still ongoing debates for and against legalisation of euthanasia. The modern history of euthanasia starts from the 19th century. Euthanasia has sparked intermittent debates and activism in North America and Europe. There are lots of discussions on pros and cons are going on among different organisations and religious groups. According to medical historians, it was the availability of anaesthesia that inspired the claims for legalisation of euthanasia in recent past. In 1828, the first known anti-euthanasia law was passed in the State of New York which was followed by many other states and localities over a period of several years. After the American civil war, voluntary euthanasia was promoted by advocates, including some doctors. Support peaked around turn of the century in the US and then grew again in 1930s. While some proponents focused on voluntary euthanasia for the terminally ill, others expressed in involuntary euthanasia for certain eugenic motivations (for example) for the mentally defective. During this same era, meanwhile, US court tackled some cases involving critically ill people who requested physician assistance in dying as well as 'mercy killing' such as by parents by parents of their disabled children. From that to-date there are so many cases of this sort in Europe which finally resulted in governments being unable to positively react to the enormous requests, for example Texas in America giving permission for non-aggressive euthanasia. Euthanasia may be conducted passively, non-aggressively and aggressively. Passive euthanasia means to withdraw common treatments such as antibiotics, drugs, or surgery or the distribution of medication to relieve pain knowing that it may result in death. Passive euthanasia is the most accepted form and it is the common practice in most hospitals. The second type, non-aggressive euthanasia is to withdraw life support and this is more controversial. Aggressive euthanasia which is also called active euthanasia, entails to use lethal substances or forces to kill and is the most critical. Euthanasia can be conducted with or without the consent of the person. The latter is obviously a murder and hardly debated. The euthanasia of the patient whose illness cannot be cured, administered by his own or patient's related ones' consent is what is called mercy killing - to kill with minium or without pain or distress. All the orthodox theistic religions are disapproved of euthanasia because of the notion that the life belongs to Supreme God, the creator, and it is a sin to harm what is owed by God. However protestant Catholic church is approved of limited type of euthanasia. What is the position of Buddhism regarding euthanasia? Buddhism holds that all types of intentional killings to be resultant bad. Killing simply means to deprive another being of life. Still Buddhism does not represent an extreme form of teaching. Only the intentional killing is resultant but not otherwise. Buddhism name the intentional resultant action as Kamma. Is the practice of euthanasia a killing? Taking doctor assisted euthanasia, a patient in severe physical pain request for a less painful death and the having obtained the consent, doctor assist the patient to die so. 3. The patient may be passively euthanised by stopping medical treatment, chemotherapy, dialysis, artificial respiration, blood transfusion, IV drip, etc. 4. The physician must have (ineffectively) exhausted all other measures of pain relief. According to above conditions, we are clear that the euthanasia is practised by doctors on behalf of relieving the patient from unbearable physical pain whose death is certain because of that illness. With mercy towards patient he or she is made to die or assisted to do so. According to Buddhism, the beings are in the cycle of existence because of their bond to the worldly existence. Enormous types of suffering is an inevitable fact in the existence of life forms. Buddhism does not see death to be the end of suffering. It was materialists who regard death to be the salvation. Buddhism affirms re-becoming. Suffering one's experiences could be the fruition of a past action. So, the death can not end the suffering. Though one gets a temporary relief here, he will happen to experience it in another life. Non-self theory of Buddhism too is related here. Self was thought to be the identity of the person. Buddhism does nor affirm identity. The life forms are not with identities rather they are psychophysical processes. In life there is nothing to take as I or Mine instead there are only five heaps (Khandhas-aggregates) that constitute the psychophsicality. This means what we call our life does not actually belong to us. Although we can influence its existence in good and bad conducts we cannot administer it in its totality. On the part of a patient, to kill oneself does not mean that someone's decision regarding one's own life, since the notion of my life or his life etc is baseless from the Buddhist point of view. What makes the difference is the mental condition. All the conducts - physical, verbal and mental of sentient beings are categorised wholesome, unwholesome and neutral according to their rewarding nature. First and the second are respectively bad-resultant and the last is out of results. Each unwholesome deed is taught to energise by root unwholesome mental causes; greed, hatred and delusion and each wholesome deed is other way round, root wholesome mental causes. These root causes are emotional states. The sentient beings are motivated by these emotions because of pleasure, pain experience. The beings are cankering for worldly pleasures (sukha kamani bhutani) and when they do not get those pleasures all the time they are motivated by these so-called root mental causes. Impermanence, suffering and non-selfless being the basic characteristics of life, we are subject to pain. The lack of understanding of the basic nature of life compel beings towards acting emotionally. This suggests that both the doctor and patient who compel to euthanasia are acting motivated by emotions whose actions, in turn, are resultant. This is why Ven. Dr. Sri Dhammananda Thera in his What Buddhists believe argues that" mercy and killing can never go together". It is not the mercy in the real sense that activists, but greed, hatred and dilution. However, it seems that it is the patient who is more responsible for euthanasia. As the laws are passed, a doctor happens to practises euthanasia on a circumstance of patient's request. Ven. Dr. Sri Dhammananda Thera, referring to animal euthanasia, argues 'when some people see their dogs or cats suffer from some skin disease, they take action to kill those poor animals. Actually it is not that they have mercy towards the suffering animals, but they kill them for their own precaution and get rid of an awful sight". It is factual that, by any means, euthanasia can not be justified in Buddhism. But by a close study of Buddhist teaching it is possible to reveal that to kill out of necessity and without any anger or hatred has less bad reaction than to kill out of in teens anger or jealousy. The Lonaphala Sutta of the Majjhima Nikaya explains when the handful amount of salt is put into a cup of water, the water becomes salty; but once the same amount of salt is thrown into river the water of that river does not make the same result. It is condition of mind (thought) determines the rewards of a particular action. As was mentioned above, the cetana or thought that functions on the occasion is not like that in a killing with hatred.